Lasting makes marriage counseling simple. 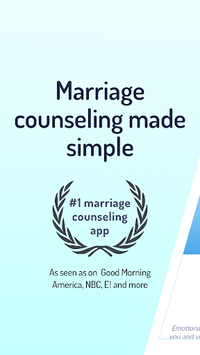 Build a healthier, happier relationship in a few minutes a day with the nation's #1 marriage counseling app. 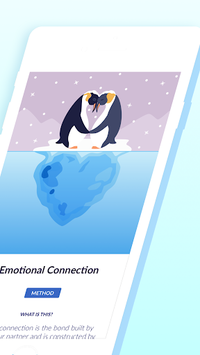 As seen on Good Morning America, NBC, and many more, Lasting gets to know your relationship and creates a program to help you build and maintain the health of your marriage. Whether you want to deepen your connection in new ways, repair a broken part of your marriage, or learn specific skills, like communication and conflict, Lasting will walk with you every step of the way with counsel based on decades of research. You get free access to our Marriage Health Intro series, which includes your assessment, an original audio track entitled "How To Keep Your Marriage Healthy," and 3 foundational exercises! 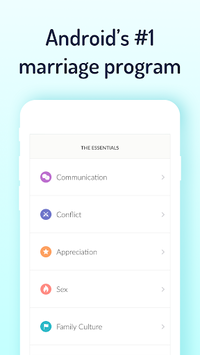 You also get free access to our habit-building Healthy Marriage Reminders feature. Try a Premium subscription free for 7 days. You can cancel any time. It's $11.99/month after your trial. We also have an annual subscription available for $79.99. Lasting subscriptions renew within 24 hours before the subscription period ends. Manage your subscription in your Google Play Store settings. 1. Two spots - one for you, one for your partner! Learn how to stay healthy and happy, together, for a lifetime. Lasting is for all people and adapts your program based on your relationship's Strengths and Growth Areas. Marriage is a lifelong journey. Let Lasting be your guide. Please note: this is not marriage counseling or couple's therapy. This is a proactive marriage health program. Hi, Lasting couples! This release fixes a few pesky bugs. Stay tuned for a big upgrade: Lasting 2.0 is coming in a few weeks!